It’s the most discussed foreign policy issue in America. ISIS now holds vast portions of Iraq and Syria, and is expanding into Yemen and other countries wreaking havoc and committing gruesome acts of violence. The U.S. and its allies are fighting the spread of ISIS through a series of measures, including military forces in an advisory capacity in Iraq. But the issue that President Obama and Congress are being forced to come to terms with is whether to put U.S. combat troops on the ground to fight ISIS in the Middle East. 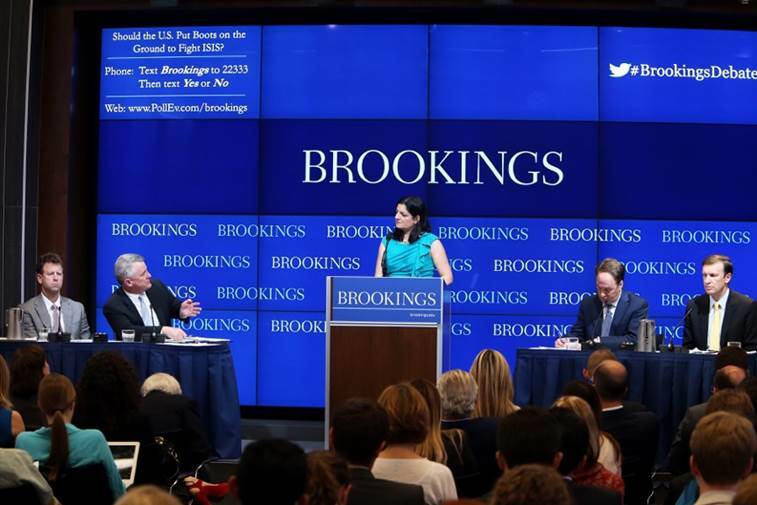 On Wednesday, June 24, Brookings hosted the first in a new series of Brookings Debates to argue both sides of the issue. Arguing in favor were Brookings expert Michael O’Hanlon and Michael Doran of the Hudson Institute, and taking the opposite side were Brookings’ Jeremy Shapiro and Senator Chris Murphy (D-Conn), who is currently working to submit an amendment to prohibit boots on the ground without explicit congressional approval. The event was moderated by Indira Lakshmanan of Bloomberg Business. Michael Doran kicked off the debate by immediately firing a salvo at the opposing side, claiming that Senator Murphy and Shapiro were adhering to the “Palin Doctrine,” referencing Sarah Palin’s infamous suggestion that the U.S. stay out of crises in the Middle East and “Let Allah sort it out.” Doran continued by arguing that if the U.S. flatly refused to send ground troops it would effectively be conceding that it did not have strategic interests in the Middle East. Mike O’Hanlon’s perspective throughout the evening was more nuanced. He conceded middle ground with the opposition on many issues, but argued that U.S. ground troops is a necessary part of the prescription required to developing our allies and properly training local forces. Key to his case were that Iraqi Prime Minister Abadi may not survive in power if the U.S. doesn’t help him succeed, and without U.S. forces the situation on the ground may get worse rather than just stay the same. O’Hanlon also pushed back on the idea that boots on the ground would turn into another quagmire, and argued that a strategic doubling or tripling of U.S. forces would provide a manageable path to stability. “You have to be sure that U.S. troops will accomplish this objective [to degrade ISIS to a non-threat] and that there is no other way,” Murphy said, who followed with three specific reasons we cannot be sure: 10+ years of experience in the Middle East to show that limited ground forces don’t work, military action would set back rather than advance the political reconciliation, and it would be a disincentive to provide actual tools to promote long-term stability. Brookings expert Jeremy Shapiro took a big-picture view of America’s security situation, making the argument that troops to fight ISIS won’t affect the real problems, like gun violence, that threaten the security of Americans today. He questioned the fundamental effectiveness of any military option in the Middle East, citing our lack of effective allies and our troubled recent history in the region. Shapiro also quoted Prime Minister Abadi, saying he doesn’t want U.S. ground troops, and that he would treat them “as enemies.” “That’s our ally,” said Shapiro. 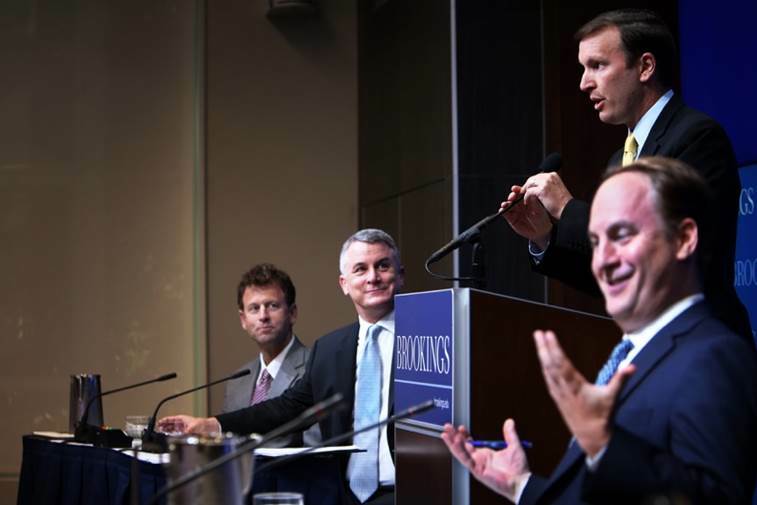 UPDATE: All four panelists from the Brookings Debate have shared their opening remarks on the Order from Chaos blog. Read Michael Doran‘s and Michael O’Hanlon‘s arguments for intervention, and Senator Chris Murphy‘s and Jeremy Shapiro‘s arguments against.